Which city is tops for EV ownership? Of all the cities in all of New Zealand, which one do you think would boast the highest proportion of electric vehicles. You can take your pick from (in alphabetical order): Auckland, Christchurch, Dunedin, Hamilton, Lower Hutt, Napier/Hastings, Tauranga or Wellington? It might look as if it the city is running neck and neck with Wellington in the above graph, but Carsten Dortans at Otago University's Centre for Sustainability says Dunedin just nudges ahead. "Dunedin has by far the largest number of pure electric vehicles per 1000 people (3.73), with its closest rival being Wellington (3.19). When both pure electric vehicles (e.g. Nissan Leafs) and plug-in hybrid electric vehicles (e.g. Mitsubishi Outlanders) are counted, Dunedin still just comes out top (4.34), marginally ahead of Wellington (4.33) which has a greater proportion of PHEVs," Dortans says. Dunedin also has the highest proportion of electric vehicles registered for personal use (as opposed to commercial or other use), followed by Wellington and Christchurch. But while this might be a source for Southern pride, the Sustainability Centre's Associate Professor Janet Stephenson points out that it is still only tiny fraction of total car ownership. "Electric vehicle ownership is increasing exponentially, going from around 25 in 2015 to more than 500 today. However, this is still a drop in the bucket - less than half a percent of Dunedin's 104,000 registered vehicles," she says. The reasons for Dunedin's lead in electric vehicle ownership are in part credited to a greater awareness of their appeal - not only are they kinder on the planet, but the cars themselves are becoming more affordable (and indeed it is possible to pick up a second-hand Nissan Leaf for less than $10,000 on Trade Me), and cost very little to run. Pam McKinlay, from the Dunedin's Electric Vehicles owner's group, says there is a growing interest in the cars. "I think our electric vehicle advocacy and education has probably helped, but Dunedin people are really interested too - we are always in demand for other events and festivals as well as the dedicated EV events we put on." 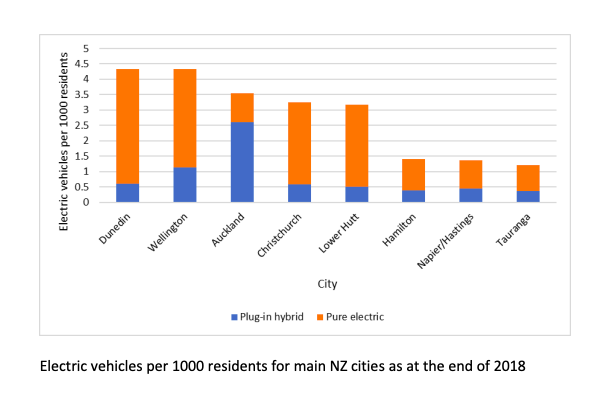 The analysis of electric vehicle ownership is part of the Dunedin Energy Study, a joint project between the University of Otago's Centre for Sustainability and the Dunedin City Council. Now in its fourth year, the Study gathers data on all energy inputs in Dunedin and concluded that in 2018, the total amount of energy in Dunedin had increased by 5% from 2017, while total greenhouse gas emissions increased by 6%. Emphasis is placed on the adoption of electric vehicles because transport uses half of the energy consumed in the city, producing most of Dunedin's energy-related greenhouse gas emissions. You can find out more about the study here.